The first trailer for 20th Century Fox’s new “Fantastic Four” only gave a quick glimpse of Jamie Bell as The Thing, but now fans of the Marvel character can stare at the latest design in all of its rocky glory. 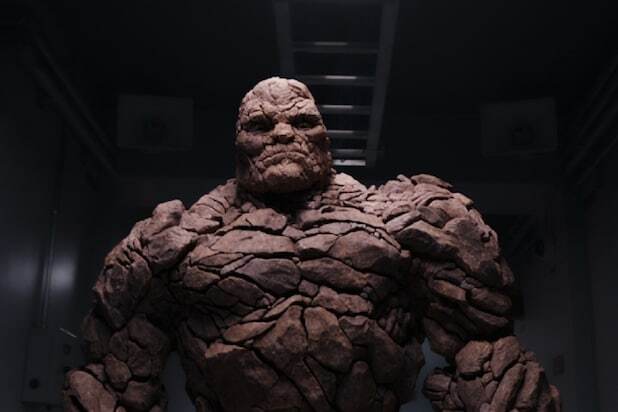 On Thursday, the studio released three new stills from director Josh Trank‘s reboot of the franchise, and a close-up of the mutant previously played by Michael Chiklis (“The Shield”) was one of them. Miles Teller plays Mister Fantastic, Michael B. Jordan stars up as the Human Torch and Kate Mara is the Invisible Woman, while Toby Kebbell plays villain Dr. Doom in the movie hitting theaters on Aug. 17. Unlike the studio’s last incarnation of the Marvel comics property, the “Fantastic Four” will travel to an alternate universe — not space — to accidentally obtain their powers. Or in Bell’s case, disfigurement. But at least he’s super strong, and basically indestructible. Take a good look at The Thing above, then two more stills below.